Ever get fed up trying to put a round frying pan on to your hob? Member Richard Stead and his friend Terry Steel have been testing an innovative new product in Richard’s Bongo. Since I was a kid arriving at the seaside after an exciting journey in Dad’s old banger, removing my soggy wrapper from the squashed tomato sandwiches was the high point of my day. Picnics and barbecues, al fresco dinners and bonfire-night suppers are among my happiest memories. Naturally, I find myself cooking a lot as I always volunteer for galley duty on boats and mess duty at camp. I get a kick out of feeding ravenous hikers and deck crews coming off a long watch. If the sea does a roller coaster or a hurricane threatens to tear the canvas from its poles my humour improves with the challenge. Keeping the flames alive and the food in its pans is more fun than hauling in the sails or digging storm trenches. Mostly I get to cook on two-ring burners, and it’s amazing what can be accomplished as long as the gas flows. My friend Richard Stead gave me a frying pan. Why? Because he knew I would have to test-fry it and he’d get fed in the process and that’s what I did this morning, in fact I was so taken with the pan’s design I bought another. I turned out a magnificent hot, breakfast in double-quick time. With one round pan I would have had to put items in a queue for space and that would mean some parts of the meal getting cold. These pans are deep-sided, and rectangular! In the back of Richard’s bongo they fit easily side by side and made best use of the space on the cooker. But best of all they’re made of thick material with a heavy-duty coating of non-stick and the heat conducted evenly and effectively. I cooked 2,suauages, four rashers of bacon and four rounds of black pudding in one pan and in the other: two field mushrooms, two hash-browns and two eggs. I confess to heating some baked beans in a trice after plating up and emptying both pans, not that I couldn’t have found space beforehand but it would have messed things up. 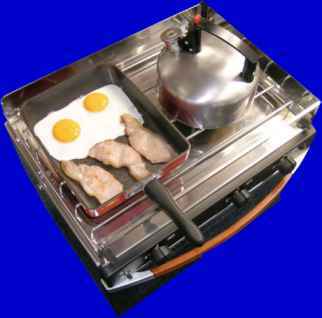 The ‘Boatie Frypan’ is a must and I find myself saying “Why didn’t anyone think of this before?” Don’t you just love messin’ about in boats? Bon appetit from Terry Steel, a fry-baby and I don’t care who knows.